I don't have a blog category for potatoformers. Now I'm definitely getting the Optimash Prime here for my new office. I have absolutely no qualms about this kind of fun cross-brand promotion at all and the Star Wars variations, while I don't own them, pretty much foretold the coming of this here guy. However, the major reason I'm gonna buy this is the fact that he's a G1 Prime. I find it funny that Hasbro so often seems to want to abandon the past but here's another example where they deemed it appropriate to totally change "Optimus" for the movie yet a cross-promotional toy is designed around a 20-year-old appearance. Then again, there's a shitload of late 20-something males that will see this and know immediately who it is without even having to see that name. There's something to be said for icons. 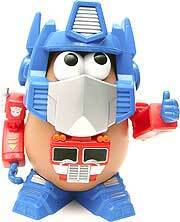 There's also something to be said for childhood-toy-cartoon-marketing brainswashing too! Any idea when Optimash prime and the galactic heroes TF's hit the shelves? If it's in stock there, it's gotta be soon. This page contains a single entry by Nala published on May 7, 2007 8:14 AM. Can you feel the love tonight (on your windshield)? was the previous entry in this blog. Jaime's name is almost girlish isn't it? is the next entry in this blog.